Coloplast Assura 2 Piece Skin Barrier, by Coloplast, is a 2-piece skin wafer with belt loops. 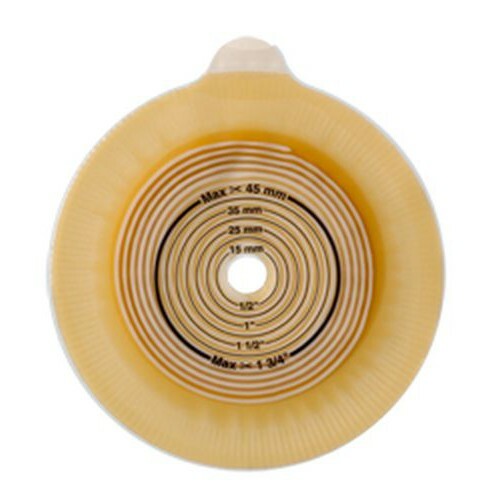 Coloplast Assura barrier wafer is available in cut-to-fit and pre-cut options for those wearers who need a wide range to match their stoma openings. The range of features will benefit many different iliostomy and colostomy patients. The Coloplast Sensura Assura barrier features the click style fastener to make securing the bag and wafer together easy. It uses a mechanical coupling that will make an audible 'click' to confirm that the pouch is locked to the wafer barrier. Coloplast Assura come either as standard wear or extended wear, in both flat, convex, and convex light shapes. The Assura barriers are pre-cut as well as cut-to-fit. The pouch opening and the wafer is simply matched together and pressed firmly until a click is hears. To get the pouch into the most comfortable position to wear, it can be rotated into the desired position to accommodate your body's position (standing, lying down, emptying) without having to remove the pouch from the barrier. The mechanical coupling can also be re-positioned to enable easy handling whether the user is left or right-handed. 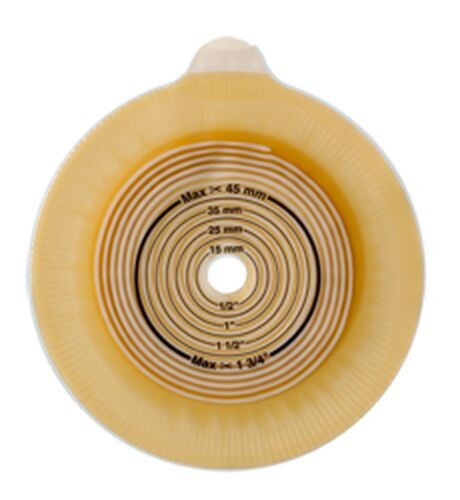 The pouch can be removed separately from the Assura spiral-adhesive barrier, allowing the pouch to be changed more frequently than the adhesive barrier. SenSura Click Barriers are available shaped flat, convex, or convex light. These can be combined with drainable, closed or urostomy pouches, as well as a range of special solutions including a night drainage bag, mini cap and much more. Coloplast ostomy 2-piece systems are size based on a color-coded coupling system. For instance, a barrier with a "red" coupling size must be matched to a "red" pouch. The barrier comes cut-to-fit and has pre-cut selections. The wafer has a click-in fastener to make it easy to connect to the pouch. The wafers are color coded to match the appropriate pouch size opening. The pouch can be removed separately from the spiral adhesive barrier, allowing the pouch to be changed more frequently than the barrier. The pouch can be re-positioned to enable easy handling for left or right-handed users. There is flat, convex light, and convex shape options. Product Numbers: 2831, 2832, 2833, 2881, 2882, 2883, 12701, 12702, 12703, 12704, 12705, 12706, 12707, 12708, 12709, 12716, 12719, 12841, 12842, 12844, 12845, 12847, 12848, 14232, 14233, 14234, 14235, 14236, 14237, 14238, 14239, 14243, 14246, 14249, 14250, 14251, 14252, 14254, 14255, 14257, 14258, 14261, 14262, 14263, 14271, 14272, 14273, 14274, 14275, 14276, 14277, 14278, 14281, 14282, 14283, 14291, 14292, 14292A, 14293, 14294, 14295, 14296, 14297, 14298. Been using the Coloplast pouching products for 15 years, best product on the market. Very happy with the perfomace of this product. Last longer, takes up less room and is easier to clean up after removal which is also easier than the competitions!